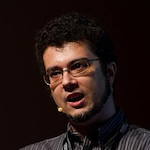 Stefano Zanero received a PhD in Computer Engineering from Politecnico di Milano, where he is currently an assistant professor. He has an extensive speaking and training experience in Italy and abroad, with tens of co-authored papers and presentations in top conferences. He’s a Senior Member of the IEEE, the Computer Society, ISSA and the ACM. He sits in the Board of Directors of ISSA and in the Board of Governors of the Computer Society. Stefano co-founded Secure Network, a leading Italian information security consulting firm, and 18Months, a cloud-based ticketing solutions provider.